Theatre / “Baskerville – a Sherlock Holmes Mystery” by Ken Ludwig. Directed by Rob De Vries. At Gungahlin Theatre until April 27. IF variety is the spice of life, versatility must be the icing on the cake and in this case the Dramatic Productions current season of “Baskerville” has both in spades. 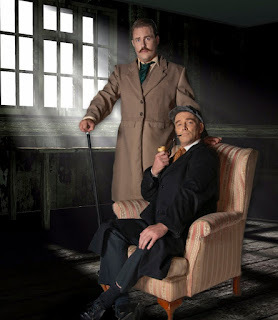 Ken Ludwig’s take on what was perhaps Conan Doyle’s most popular mystery gives audiences plenty of reasons to be pleased to have made their way to the Gungahlin Theatre to marvel at, and applaud, this production, under the direction of Rob De Fries. The original story concerns the devices adopted by scheming baddies to wrest the estate of a recently-deceased lord-of-the-manor from the hands of the rightful and high-minded heir, accompanied by maidens in various states of romantic distress. In this version, the cast consists of the inevitable Holmes/Watson duo, supported by three hardworking actors in a bewildering whirlpool of multiple roles. 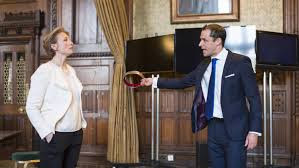 So numerous and swift are the various character changes that it would be invidious to identify any one of this trio of madcap performers (Nicholas Steain, Teresa Wojik and Michael Cooper) against any one of the many characters they portray. Sufficient to say that each of these actors convincingly presents their roster of characters as clearly identifiable individuals – aided in their diversity by the variety of Emma Graham’s well-wrought costumes. The Spiegeltent. Civic Square, Canberra. 13th April 2019. 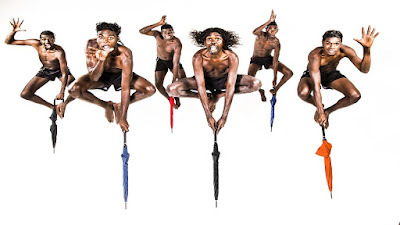 When the Chooky Dancers first performed in the Canberra Multicultural Festival more than 10 years ago, they were six wide-eyed Yolngu boys from northern Arnhem Land who had found themselves a worldwide phenomenon as the result of a video-clip that had been uploaded on the internet. In this clip they performed a hilarious version of “Zorba The Greek” in which they combined traditional indigenous dance steps with modern dance moves. Their clip attracted not only millions of viewers worldwide, but also invitations to perform their dance around the world. 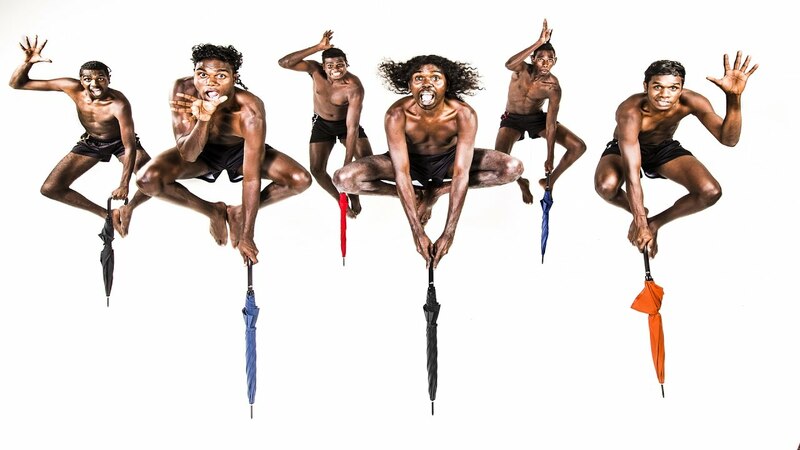 The Chooky Dancers have now morphed into Djuki Mala, surprisingly, not six dancers as indicated in the publicity, but a highly accomplished trio, Baykali Ganambarr, Wakara Gondarra, and Marko Garmu, who perform with disarming joie de vie, an entertaining mish-mash of tightly choreographed dance routines, some traditional cultural dances, others tongue-in-cheek interpretations of familiar pop-songs, interspersed with documentary film sequences of female elders explaining Yolngu traditions, and the history of the Chooky Dancers. The zany “Zorba” dance is still there, danced much more professionally these days, and there’s a delightful mash-up of Gene Kelly’s “Singin’ in the Rain” incorporating brightly coloured umbrellas. There’s a Motown medley, a Bollywood dance with dancers wrapped incongruously in gold satin, and a dazzling Michael Jackson moment when one of the dancers was rewarded with excited spontaneous applause for his expert execution of Jackson’s signature moonwalk. A slickly conceived high energy presentation, Djuki Mala is sometimes silly, sometimes puzzling, occasionally moving, always entertaining, definitely irresistible. It drew a standing ovation from the large appreciative audience attracted to its first Spiegeltent show in Canberra. Spooky Men’s Chorale – Workshop at The Majestic. National Folk Festival, Canberra, Saturday April 20, 10.30 am. With a mention of Phil Bates at the Flute ‘n’ Fiddle. Spooky Men’s workshop was a great example of classroom management, but raised questions in this one-time teacher’s consciousness about political bias in education and society. The great thing about the National Folk Festival is that’s where you meet old friends on common grounds. Penny, a teaching colleague on occasions and a public servant retired from the federal Department of Education, is a person whose observations I know I can trust. Though it’s not possible to review the whole four-day NFF from the one day and five main performances I attended, she thought there was much less overt political material on show this year. Why would this be so with a May 18 election in the offing? Shouldn’t we expect more, not less? Disturbing my self-indulgent equilibrium – just enjoying the wonder of singing, dancing and musicianship of my annual Easter escape into the world of folk – Penny’s thoughts struck home. Of course, as you would expect, there were social issues behind the songs of Stu Tyrrell – but more of a personal nature than strictly political. His was literally a family show – his family – with his very young but wonderfully enthusiastic daughter up on stage with her favourite Dad. Ricardo Tesi & the Banditaliana were terrific performers, filling the Budawang with, for me, a new kind of concert Italian Folk. 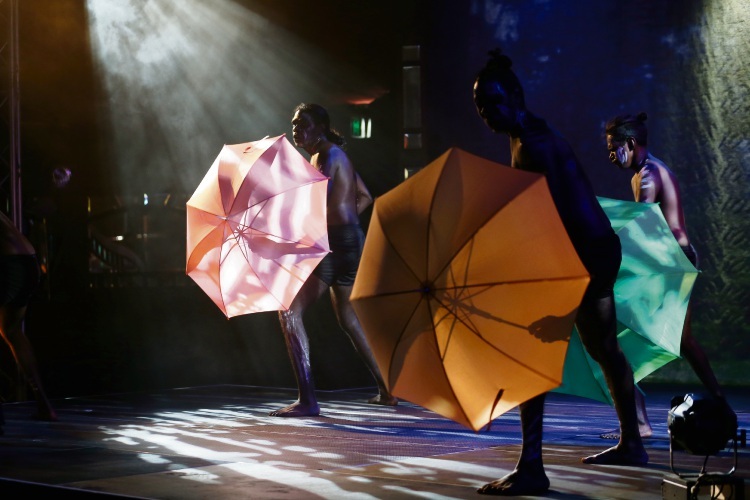 And just the fact that Yolngu man Gawurru Gaykamangu, from North East Arnhem Land, was performing his own work in language and had a crowd dancing along, was a political statement in itself. Phil Bates, a quietly spoken and singing presenter of what I think of as traditional Australian folk songs, entirely un-commercial in origin, explicitly spoke and sang politically. His Andy’s Gone with Cattle Now by Henry Lawson made the life of the ever-waiting worker’s family a sad reflection on the demands required to earn a living. But only in his last item did he raise the politics of modern times. He said that in an interview, Arlo Guthrie had said we don’t need to write new songs about the dire straits of democracy, because we already have them from 1968. So the political guernsey falls on the shoulders of the Spooky Men’s Chorale, described (by them) – accurately – as a “vast, rumbling, steam powered and black clad behemoth, seemingly accidentally capable of rendering audiences moist eyed with mute appreciation or haplessly gurgling with merriment.” I know this is true because I saw them at a previous NFF, in between their overseas tours (they’re Blue Mountains men, from the fog-bound ranges west of Sydney). But this was a workshop, and we were going to learn how to sing like them. So my praise begins with their musicianship – which certainly has my mute appreciation; and goes on to their leadership, teaching us a new song in four parts, rising in pitch and rhythmic complexity, our merriment gurgling all the way until a final point of chaotic haplessness. Vote them; vote them; vote the bastards out. Then there was the maudling bit about wondering why some people vote them in, and wanting leave the country. Then a reprise of the original lines, designed to reach a crescendo of chaotic waving and yelling “out!”. I thought GetUp! should take the Spooky Men to the electorate of Warringah to take over the campaign management, especially since our audience in The Majestic looked to me exactly like the middle class nice people who have set up Vote Tony Out at www.votetonyout.com . But Penny pointed out the undercurrent of lack of enthusiasm for this election. She said what the corporates want is for people to not believe in anything to vote for. The ploy is to undermine representative democracy, to get government out of the way, not pay taxes, encourage individual libertarianism, and have people go along with “We’ll give a fair go to those who have a go”, and hard luck to the rest. And suddenly (half a day after the Spooky workshop experience) I had the most horrifying thought. The spooky part of their song it’s only against. Is the Spooky Men’s Chorale, by so cleverly getting us into a state of gurgling merriment over voting the bastards out, actually working as an arm of the corporates who want the ‘freedom’ from people being voted in because they are for something – like regulating the market. Oh horror! Where goes the Folk Tradition now? Are The Times A-Changin’? How Spooky is the Men’s Chorale! National Theatre Live, UK, shown at Dendy Cinema, Canberra: April 20, 21, 22, 2019. Original season on stage at Almeida Theatre, London, UK: Previews 10 Dec – 17 Dec; Season: December 19, 2018 – February 2, 2019. 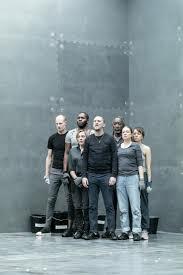 This modern pared-down but full of symbolism interpretation of Shakespeare’s Richard II is absolutely fabulous theatre by London’s Almeida. I mean this literally, for it shows Shakespeare’s genius for fable-making – turning (for him) a century old history into an everlasting story of universal significance. Director Hill-Gibbins’ genius is to have turned (for us) a 400-year-old work of theatrical art into a gripping emotional and intellectual experience – a study of the nature of political power – of crucial importance to us, now, as it was for Shakespeare and his audience, then. How is it done? What does it mean? Why should Almeida Theatre be so highly praised? 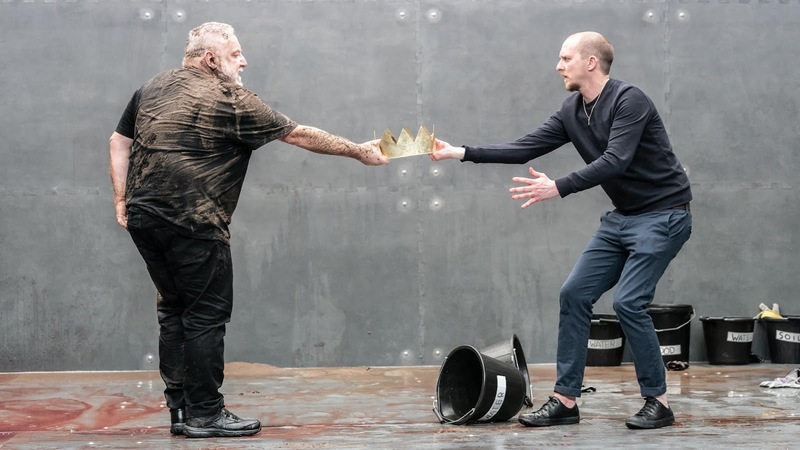 [In 2016] Jack Gamble and Quentin Beroud’s Richard II is the first Shakespeare play to have been performed at the House of Commons. The opening performance at the prestigious site sought to emphasise the relocation of the play into modern Westminster by literally taking the action there. [Then back] at Arcola Theatre the set consists of little more than a desk and regal chairs hinting at the political-meets-royal dimension of the reinterpretation. The modernisation of Richard II is intended to point out that the essence of political conflict is timeless, and that the dynamics of power can be easily transferred and applied to a modern setting. Let's purge this choler without letting blood"
Mud and blood, but where is Bolingbroke now? In 2018, at Almeida the set is a single room made of iron walls, high, with no doors or windows – the prison in which Richard, king by divine right, is held without hope by his usurper, Bolingbroke. But note that all the cast of nobles and the commoners who serve them, are all equally trapped – yet cannot learn to live together. As Bolingbroke finally ‘wins’, his power is already being challenged by the next generation as illegitimate. Or, as Shakespeare wrote, in effect, those deemed not to be having a go must be “eased with being nothing”. When this line repeats, near the end, Richard seems to have lost himself in a dream, hearing mysterious music, “and now time doth waste me; For now hath time made me his numbering clock.” Yet still he lashes out and kills two before Sir Pierce of Exton ‘strikes him down’. Is this what ‘having a go’ means, rather than being ‘eased with being nothing’? 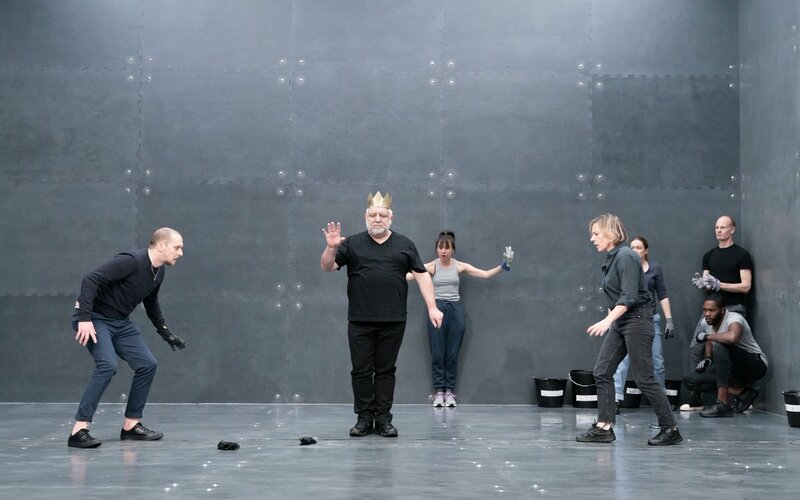 So this design, of actors in rehearsal clothes, in a set in which they, the walls and the floor become mired in mud and blood, becomes far more than a mere study of political conflict – monarchy or people power – but takes us to where time ticks us all in his numbering clock. In Shakespeare’s day, of course, people died young; yet today with all our technical advances so we have longer to live fulfilling lives of care and compassion, we still cannot learn to be eased with being nothing. Still we, like Richard, can be “irresponsible, foolish and vain” sending our “kingdoms into disarray and our courts into uproar”, as the program notes. And still like Bolingbroke we see “no other option but to seize power”, be “ambitious” and “challenge the throne” and the “divine right to rule”. Shakespeare was just 31, like a modern Millennial or Generation Z, when he wrote the character of King Richard the Second from the inside. I am never less than amazed at the maturity of his understanding; and too I am stunned by the skills of clear expression of Shakespeare’s meaning – of what each character is feeling and thinking – on the part of all the Almeida cast, with an extra plaudit for Simon Russell Beale. He achieved as he had hoped in his preview interview, shown in this film, to help us find empathy with and even some sympathy for a king who, according to history’s lights, failed his country. This is what great art can do for all of us, whatever the state of our country. The author of ‘Baskerville’, Ken Ludwig, is probably best known for his farce ‘Lend Me A Tenor’ and the long running Broadway musical, ‘Crazy For You’. As well as original works, he has written numerous new stage adaptations of classic novels and plays such as ‘Treasure Island’, ‘Twentieth Century’ and ‘Murder On The Orient Express’. His work has been performed in over 25 countries throughout the world. ‘Baskerville’, an adaptation of Arthur Conan Doyle’s Sherlock Holmes mystery novel, ‘The Hound of the Baskervilles’ was first performed in Washington, D.C. in 2015. 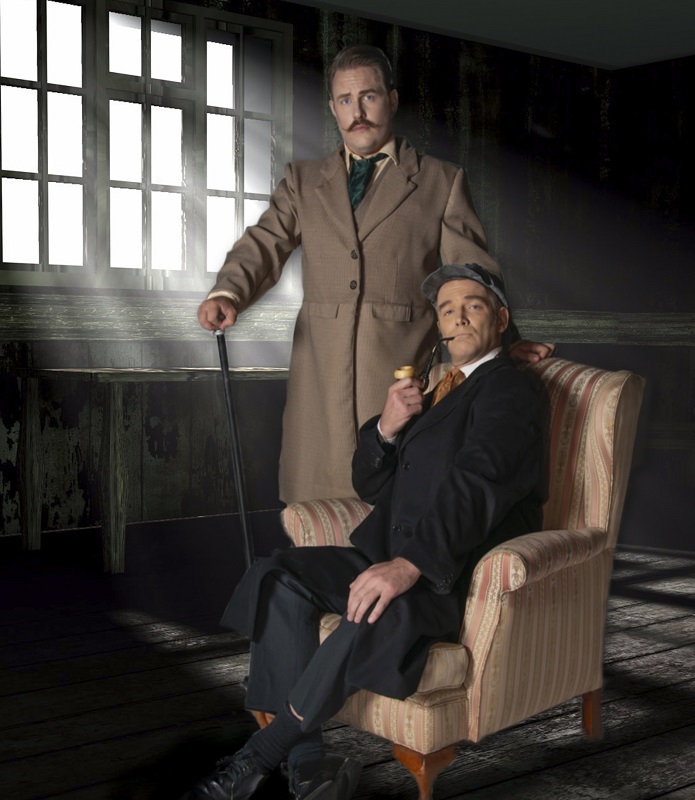 Similar in structure and style to the international hit play, ‘The 39 Steps’, the show pokes fun at a melodramatic genre by having three actors frantically play a multitude of characters around the two actors who play it straight as Sherlock Holmes and Dr. Watson. Plays like this walk a fine line. Go too far with the crazy stuff at the expense of the story and the whole confection can collapse. It needs skilful playing and strong direction. Brian Kavanagh is fine as a classic Sherlock Holmes. Adam Salter has more to do in the story as Dr. Watson and gives a creditable performance. The other three performers, Nicholas Steain, Michael Cooper and Teresa Wojcik do all the really hard work of playing the rest of the characters with numerous costume changes. Some it works but a lot of it doesn’t. The play itself has far too much exposition and extraneous characters that don’t add anything to the plot. The actors playing the multiple roles needed firmer direction. There was too much over-playing and trying to be funny rather than finding the humour within real characters. 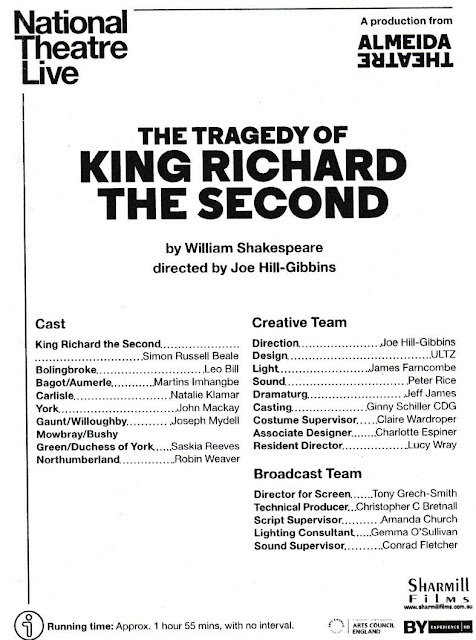 Cast members were not quick enough with their cues and the pace of the production was too slow overall. There were several moments when the stage was left empty for no apparent reason and some costume changes had not been timed well. The set, designed by Andrew Kay, looked good but certain aspects like the doors and steps inhibited the pace of the show and needed better solutions by the director. Lighting design by Craig Muller was often too dark, giving a dull look to the production rather than a period atmosphere. The overall impression of the production was that it was under-rehearsed. The type of absurdity that the director was aiming for was fine but it wasn’t achieved by opening night. Len Power’s reviews are also broadcast on the Artsound FM 92.7 ‘In the Foyer’ program on Mondays and Wednesdays at 3.30pm. Put eight English and Irish lads in a pub (even a staged pub, but with real, flowing beer) and what do you expect to happen? Well, that too, but for the most part it’s songs and music, performed by the self-appointed pub choir. Welcome to ‘The Jungle’, the pub where “The Choir of Man” takes the very simple premise of blokes gathering at the local to bond, pull chicks, celebrate, ruminate, urinate and…tap dance. The songs performed throughout the show were drawn from a plethora of genres. The audience was allowed to marvel again at the musical complexities of Queen, enjoy a funny rendition of Adele’s “Hello” and Wham’s “Wake me up”. And speaking of up, the audience was up and down all night - certainly a result of allowing them on stage for an ale at the beginning of the evening and subsequently handing around beverages during the show. 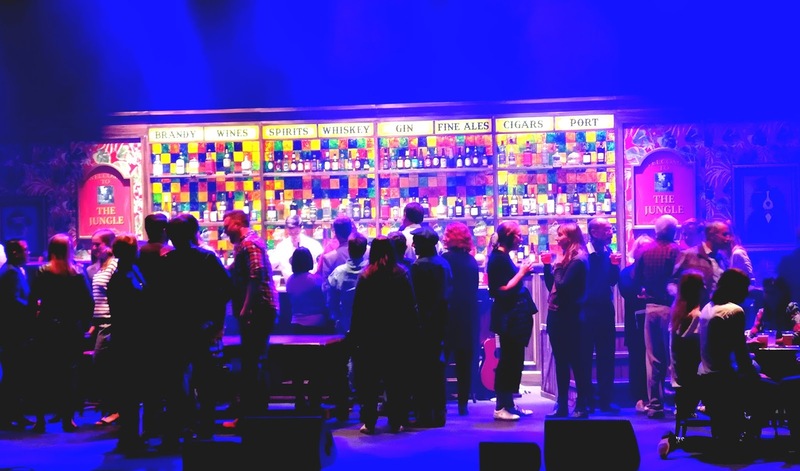 It wasn’t just the audience members requiring relieving, as several numbers played out in a make-shift urinal – a clever set design, for a sequence that had the audience in stitches. Thankfully this didn’t include audience participation, which was enlisted to help build a house of cards, or be wooed, becoming the object of affection, for the duration of the song, at least. A pina colada, some ridiculous choreography, a trumpet and a mop for props kept participants and onlookers amused and entertained. Possibly the most hilarious and frustrating sing-a-long yet, to The Proclaimers’ “I’m Gonna Be (500 miles)” kept the piano player’s “mates” and the audience on their toes. And a very good piano player he was too. Also impressive was the tap dancing, albeit occasionally performed for the most part by just one of the guys. Some of the other instrumental accompaniments were less convincing than the piano playing. A significant part of the show was plagued with mic and sound issues – late entries and mics cutting out - definitely noticeable but not enough to ruin songs or stories altogether. “Chandelier” was a harmonic highlight despite a couple of the highest notes sounding strained. The harmonies were beautiful and wide-ranging and the slowed-down, pared-back arrangement made for an impressive rendition. A poignant cover of The Kink’s “Waterloo Sunset” was very moving. In a melancholic moment, and topical for today’s audiences, the narrator of the group bemoaned the shutting down of pubs and relationships, as iconic watering holes, live music and bonding is replaced by sterile, high rise apartment blocks and lonely living. This choir of men tapped into the two things that will get any Aussie audience eating out of the palm of your hand – free beer and Johnny Farnham, then summed it all up with “Some Nights”, a song already primed for harmonies, with a thumping beat and rousing English band sound. “The Choir of Man” was sweet, fun and unpretentious. It wasn’t perfect and it wasn’t meant to be. Love, loss and harmless shenanigans played out via song, stories and choreography. Of the various women warriors on the big screen this week, Woman at War is the most unusual. It is a clever balancing act that is both playful and serious, while suggesting that Icelandic humour and world view can hit the spot at times. In Captain Marvel, a young female warrior played by Brie Larson is learning to unleash her powers and take her place in the pantheon of superheroes. The biggest blockbuster of the year so far and still going strong, it has quite a smart, witty script and Ben Mendelsohn’s performance to recommend it. Destroyer with Nicole Kidman, barely recognisable if not fully convincing, certainly packs a punch. As a driven LAPD detective on a vendetta, Kidman is tracking down a vicious criminal mastermind who has escaped justice. It is one of those interesting films that really divides critics and audiences, and it is as gritty and grim as Captain Marvel is as fun and forgettable. A very different kind of quest motivates Woman at War, a comedic drama from Iceland that is directed with wit and brio by Benedikt Erlingsson, who also co-wrote it with Olafur Egilsson. Woman at War plots the course of an environmental activist who, like David to Goliath, confronts a giant multinational corporation, Rio Tinto in fact, that is ruining the pristine countryside. In her efforts to stop it building another aluminium smelter, with Chinese backing, she becomes an enemy of the state in this engaging and eccentric film, right out of left field. Halla (Halldora Geirharosdottir), raises her long bow and fires in the first scene. Bullseye. Single-handedly – well, almost, a couple of others are in the know – she closes down vast sections of the grid and holds an entire country, albeit a small one, to ransom. When not moonlighting as a committed activist, Halla is a healthy, energetic choir director who fits in well with her community. She is single, and at 49 years waiting to hear whether her application to adopt an orphan from the Ukraine has been successful. She had all but forgotten about it, but it comes through and hears that a little girl is waiting for her. Now what does she do? How to reconcile the responsibilities of motherhood with militant activism to save the planet from environmental disaster? These are weighty issues. Perhaps the pacifist strategies of the heroes she has on her wall at home, Mandela and Gandhi, will inform her. Along the way on Halla’s journey, a trio of musicians has been playing in the background and sometimes in Halla’s own home, even turning on the telly. It is a marvellously eccentric interpellation. Later on, a trio of Ukrainian folk singers share the frame with Halla. What an inspired idea, to have the score played and sung by performers who appear in the same space as the actors. Another diverting device that keeps the mood buoyant is the hapless Spanish tourist cycling around the country. He keeps being found by the police in the wrong place at the wrong time, and is arrested on suspicion of being responsible for Halla’s acts of sabotage. It is an hilarious incidental detail. When Halla’s twin sister, also played by Geirharosdottir, unexpectedly appears on the scene, she is indeed the other side of the coin, looking for fulfilment and inner peace and harmony in her yoga and meditation. Asa’s appearance means even more screen time with this excellent lead actress. In less deft and subtle hands this funny fable from a remote and idiosyncratic land could have turned out differently. Woman at War could have been simply weird, but it is an unequivocal success instead.